3. 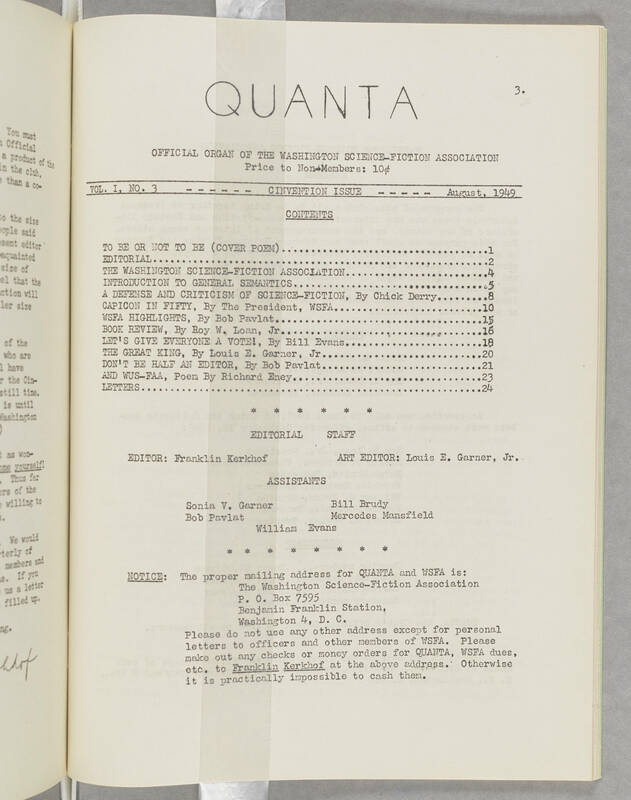 QUANTA OFFICIAL ORGAN OF THE WASHINGTON SCIENCE-FICTION ASSOCIATION Price to Non-Members: 10[[cent symbol]] VOL. I, NO. 3 - - - - - - CINVENTION ISSUE - - - - - August, 1949 CONTENTS TO BE OR NOT TO BE (COVER POEM).....1 EDITORIAL.....2 THE WASHINGTON SCIENCE-FICTION ASSOCIATION.....4 INTRODUCTION TO GENERAL SEMANTICS.....5 A DEFENSE AND CRITICISM OF SCIENCE-FICTION, By Chick Derry.....8 CAPICON IN FIFTY, By The President, WSFA.....10 WSFA HIGHLIGHTS, By Bob Pavlat.....15 BOOK REVIEW, By Roy W. Loan, Jr.....16 LET'S GIVE EVERYONE A VOTE!, By Bill Evans.....18 THE GREAT KING, By Louis E. Garner, Jr.....20 DON'T BE HALF AN EDITOR, By Bob Pavlat.....21 AND WUS-FAA, Poem by Richard Eney.....23 LETTERS.....24 * * * * * * EDITORIAL STAFF EDITOR: Franklin Kerkhof ART EDITOR: Louis E. Garner, Jr., ASSISTANTS Sonia V. Garner Bill Brudy Bob Pavlat Mercedes Mansfield William Evans * * * * * * * * * NOTICE: The proper mailing address for QUANTA and WSFA is: The Washington Science-Fiction Association P. O. Box 7595 Benjamin Franklin Station, Washington 4, D. C. Please do not use any other address except for personal letters to officers and other members of WSFA. Please make out any checks or money orders for QUANTA, WSFA dues, etc. to Franklin Kerkhof at the above address. Otherwise it is practically impossible to cash them.